Brocoli is a vegetable rich in fibre and vitamin C. I use frozen chopped broccoli to make curry. You can use the fresh broccoli too. This is how I do this curry. The main ingredients are follows..
First open the frozen broccoli box and put it in a microwave safe vessel. 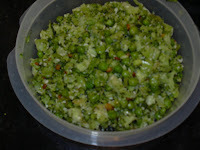 Also put the frozen peas on top of it and cook it for 6 to 8 mts. (accordingly) in microwave. Take it out and drain it. Take a wide pan, pre heat the oil, add mustard seeds when it splutters add urid dal, and asafoetida powder and fry it till everything turns into golden brown. Do not burn the ingredients. Now add the broccoli & peas to it. Add salt and saute for 2 mts. Sprinkle coconut on top of it and mix it well. Now broccoli - peas curry is ready to serve.